Who was Deborah Pease, founding benefactor of A Public Space and inspiration for the magazine's Deborah Pease Prize, awarded for the first time this year to a figure who has advanced the art of literature? A phone call in 2005 to Brigid Hughes about starting this magazine expanded over time into long conversations about everything from the size of a footnote to a favorite sentence in the magazine. 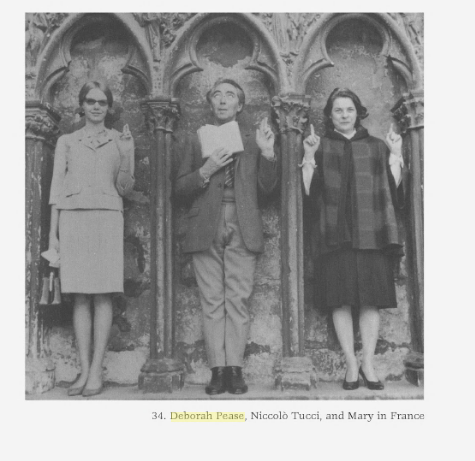 Packages, addressed in her elegant handwriting, arrived often on Dean Street, with a novel by Niccolò Tucci, a catalog from the Tibor de Nagy Gallery, news of the Poets House Showcase—for her one of the truest ways to value art was to share it. An accomplished writer and poet, she published work in the New Yorker, AGNI, Parnassus, among other journals; a novel, Real Life (Norton); and several books of poems, collected in Another Ghost in the Doorway (Moyer Bell). “Her gift, disguised as clarity, is really about the quiet irony of endings and beginnings,” one reviewer noted. The small press, the literary magazine, the independent artist were among her cherished causes. “In this economy it’s harder and harder for serious writers to get published,” she observed in the New York Times in 1983 (times have not changed!). She is remembered at Archipelago and the Paris Review for her stalwart patronage, and as a supporter of countless organizations that serve as pillars of the literary world, including Poets House, the Poetry Society of America, the New York Society Library, and the Community of Literary Magazines and Presses. She herself received the American Society of Journalists and Authors' award for "First Amendment Courage" in her role as the publisher of the Paris Review (1982-1992), and is mentioned in the New Republic for covering Mary McCarthy's legal fees in her defense against Lillian Hellman's libel suit. But for the most part she preferred to stay out of the public eye, and literary history has caught her only in glimpses: in her friendships with writers and editors, including May Sarton, George Plimpton, Douglas Crase; and, charmingly, at the movies with James Laughlin, the publisher of New Directions: "How easily J cried," she remembered, "at least at the movies! We saw Louis Malle's Au revoir les enfants and at one point I glanced at J and saw tears running down his otherwise impassive face." Please join us in celebrating the life and legacy of this extraordinary woman at our first-ever benefit party. Image: from Seeing Mary Plain: A Life of Mary McCarthy by Frances Kiernan.